Two of Georgia’s most beautiful waterfalls, on one single trail, and on a 2.5-mile hike, round trip: this is one extraordinary adventure. The High Shoals Falls Trail travels through a lush, mossy creek valley to one of the largest and most beautiful waterfalls in North Georgia. And on the way, the hike passes some prime backpacking campsites and visits the equally beautiful (but smaller) Blue Hole Falls, a single-drop waterfall with a deep, turquoise pool below. 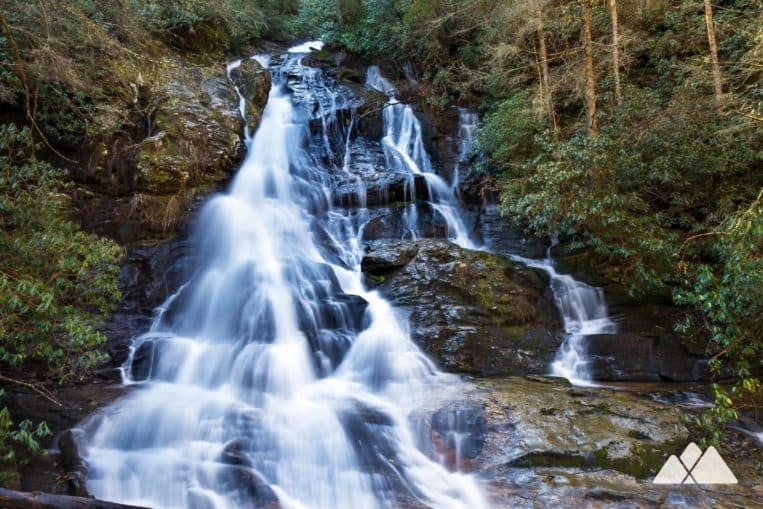 With abundant forest beauty and two gorgeous waterfalls, this trail has long ranked as one of our top 10 favorite waterfall hikes in Georgia. NOTE: The USFS reports this trail as officially closed due to storm damage. Before you go, please check for up-to-date closure information on the Chattahoochee-Oconee National Forest website. The hike departs a trailhead off the graveled Forest Road 283 north of Helen, GA (view maps and driving directions), descending through a forest of towering old-growth trees and gnarly-branched mountain laurel. 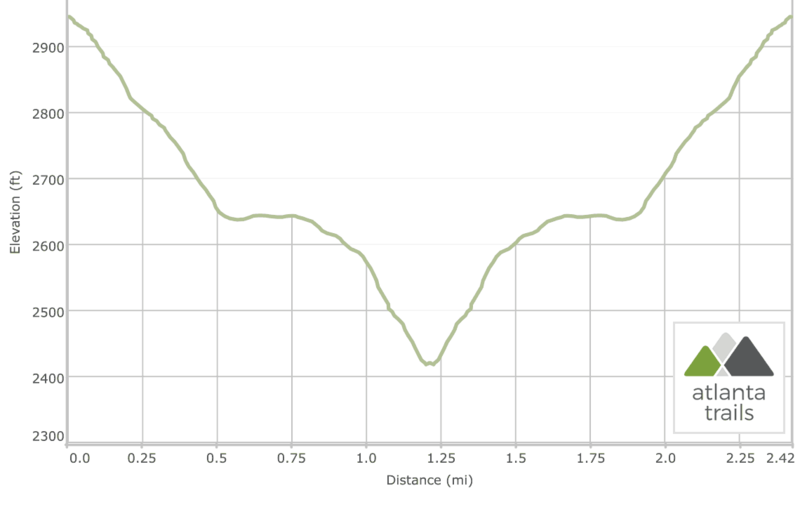 The trail hangs a hard right at .2 miles, dropping and meandering through wide switchbacks as it descends. Occasional green blazes mark the trail throughout its length, but it’s also well-worn and relatively easy to follow. 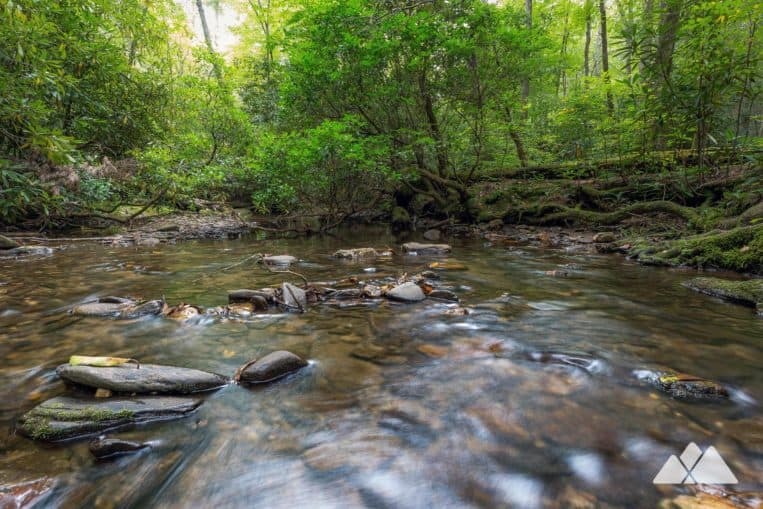 The sound of rushing water grows louder as the hike nears High Shoals Creek. The trail reaches the creek’s banks at .5 miles, swinging northbound. The route passes a large campsite before crossing a wooden bridge over the creek. The hike crosses the wooden bridge and passes several more trailside campsites along the creek. The trail winds through dense thickets of leathery-leafed rhododendron as it descends to Blue Hole Falls. Pungent-scented galax, a small, green, leafy plant, carpets the forest floor and fills the air with an onion-like scent. The trail crosses a small wooden bridge before reaching a side path at .9 mile. The hike turns left, following the side trail and dropping elevation to Blue Hole Falls. Moss and fern line the path in shades of vibrant green, a contrast with the red and orange hued, iron-rich soil and boulders of the creek valley. 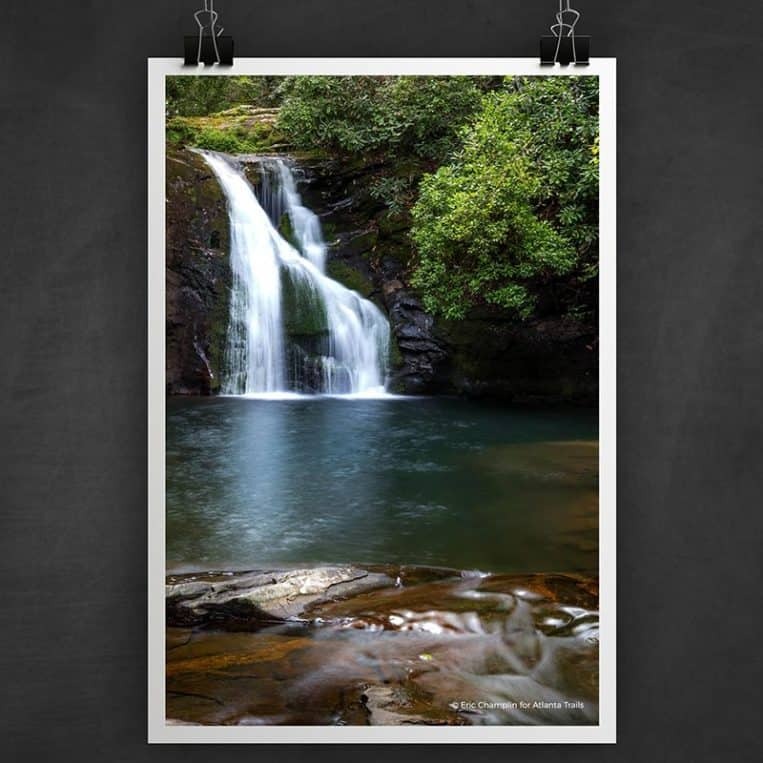 A cool, deep blue pool sits below Blue Hole Falls, lending to the waterfall’s name. The creek plummets over 20 feet over the face of a sheer rock outcrop. The hike departs Blue Hole Falls, retracing to the main trail and turning left to continue to the hike’s second waterfall. 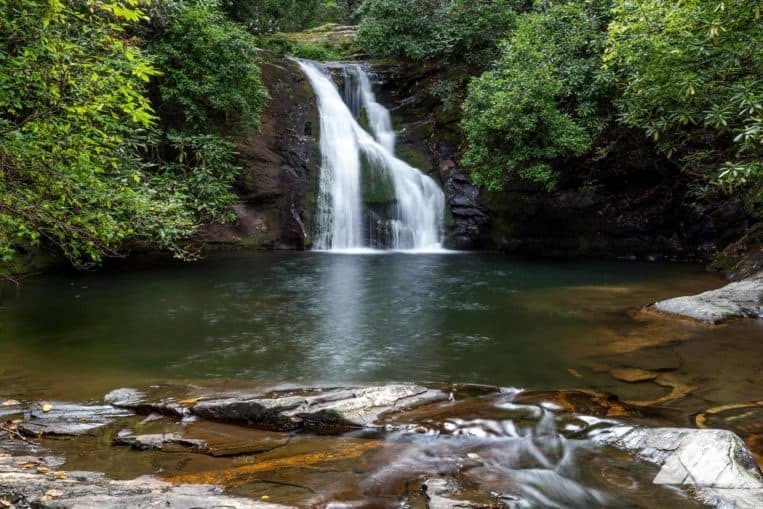 The hike follows the access trail to High Shoals Falls, turning left at 1 mile and descending to the waterfall via a series of switchbacks and stone stairs. The roaring sound of falling water amplifies through the valley. The tree canopy opens up to reveal High Shoals Falls at 1.35 miles, as the waterfall drops 50 feet in a series of cascades to a deep pool below. Departing the waterfall, the trail retraces its steps to the main trail, following its outbound steps to the trailhead. It’s a steady, nearly unrelenting climb on the return hike, gaining over 500 feet elevation. The hike reaches the trailhead and parking area at 2.4 miles, completing the adventure. In the area with daylight – and energy – to burn? 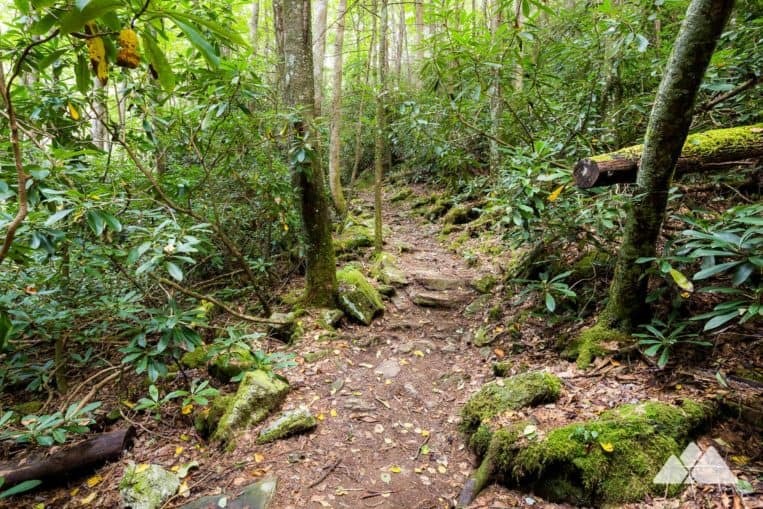 Hike the nearby Appalachian Trail to Indian Grave Gap via the Rocky Mountain summit, a challenging hike from Unicoi Gap several miles southon GA 75. Or hike the Appalachian Trail to Tray Mountain, departing from Indian Grave Gap on FR 283 several miles south of the High Shoals trailhead. Free parking is available at the USFS High Shoals Falls trailhead. 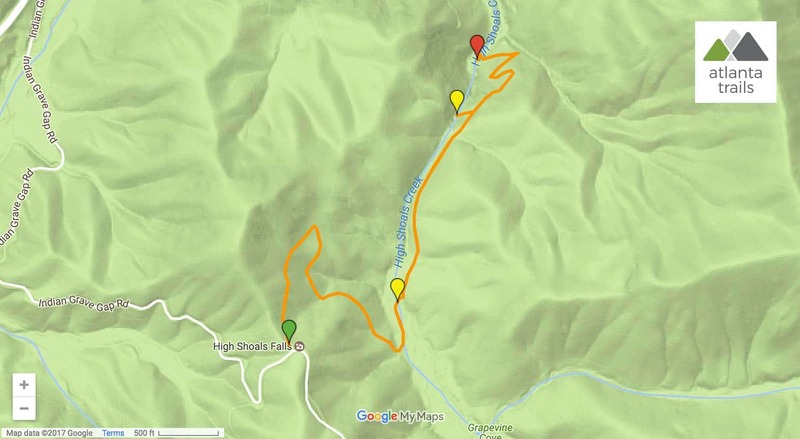 Trailhead access is via a gravel Forest Service Road, and may require a vehicle creek crossing, depending on the route.